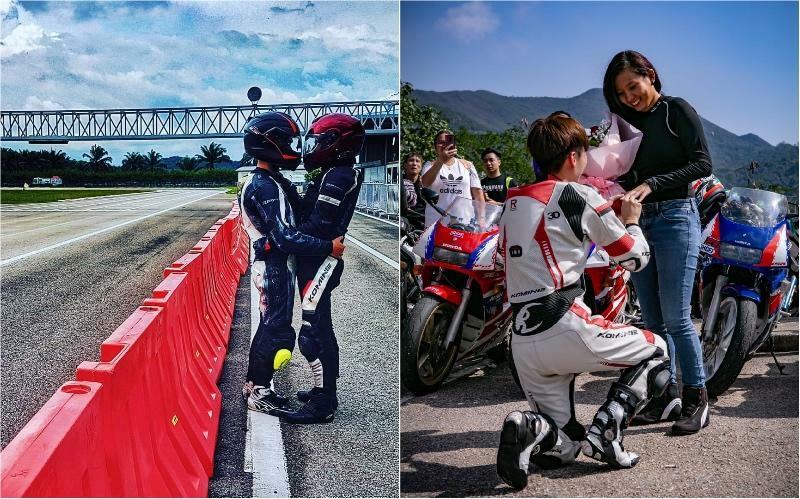 At a carpark in Hong Kong’s Clear Water Bay, surrounded by dozens of old-school motorcycles, Jackson Chan got down on one knee and proposed to his biker girlfriend. Of course, she said yes. The 32-year-old Singaporean man had been planning for half a year for the epic proposal, inspired by Hong Kong’s 1990 motorcycle-themed action flick A Moment of Romance. With an entourage consisting of over 140 friends and fellow motorcycle enthusiasts, they rode all the way on classic Yamaha two-wheelers to the hilly rural areas of Clear Water Bay on Feb 7. Zen Lee, his girlfriend of nine years, hopped on a Yamaha R1Z250 street special while Chan got on a Yamaha RD500. Not exactly Andy Lau’s Suzuki Ninja RG500 in the film, but close enough. In an interview with Stomp, Chan said that he’s been regularly riding in the Hong Kong countryside with the same group of motorbike enthusiasts since 2012, and thought that a proposal would be perfect there. Both he and Zen are avid motorcycle riders, having made a number of visits to various racetracks and off-road circuits. This article, WATCH: Singaporean man surprises girlfriend with motorbike-themed proposal in Hong Kong, originally appeared on Coconuts, Asia's leading alternative media company. Want more Coconuts? Sign up for our newsletters!